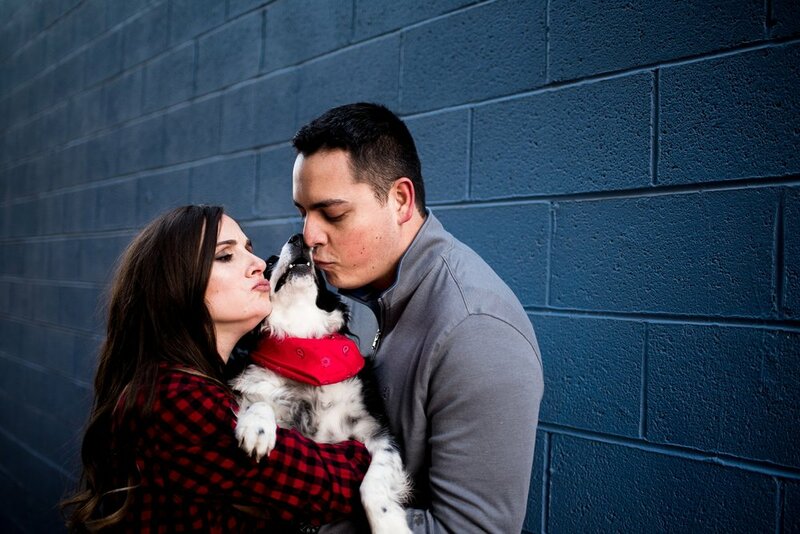 I seriously had a ball for Elika and Justin’s Pearl Street Mall engagement photos! It may sound strange but from the second I saw Elika’s Instagram page I knew we would get along well. In most ways photographing a wedding is preferable to me because of the candid and diverse nature of the day however the time spent during engagement sessions getting to know the couples I photograph is such an awesome experience that I value greatly. For instance, I found out that we all went to CU and studied engineering probably around the same time! Elika and Justin even met in their physics class! Justin now works as an engineer and Elika is like me and followed her passion is a dog walker extraordinaire! Should anyone need walks for their doggos I will hook you up with the best! Elika and Justin brought their sweet, sweet pup Ender! Ender was an incredibly good sport and made seriously the most precious faces and noises to show his distain for being held for one of the shots. I am so sorry Ender for the trouble but the results are real treasures and completely priceless! 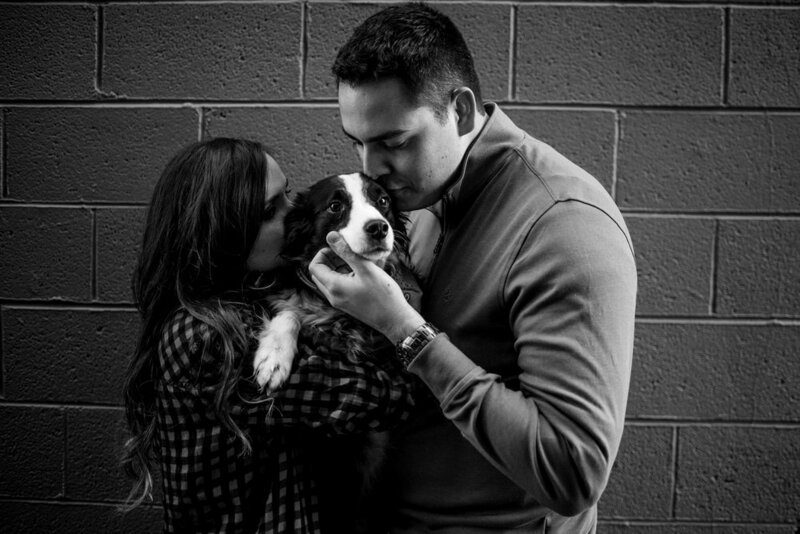 I seriously encourage couples with pups to incorporate them into their engagement sessions or weddings because to me the animals in our lives are not ‘pets’ they are family. Growing up in Boulder I have spent my fair share of time taking photos on Pearl Street, but this was the first time I have spent an extended period of time with a couple (well triple actually! ), and honestly it is a playground of endless opportunities. As any Coloradan I love the mountains and stunning natural backdrops we have access to in this state but I really, really dig urban settings. 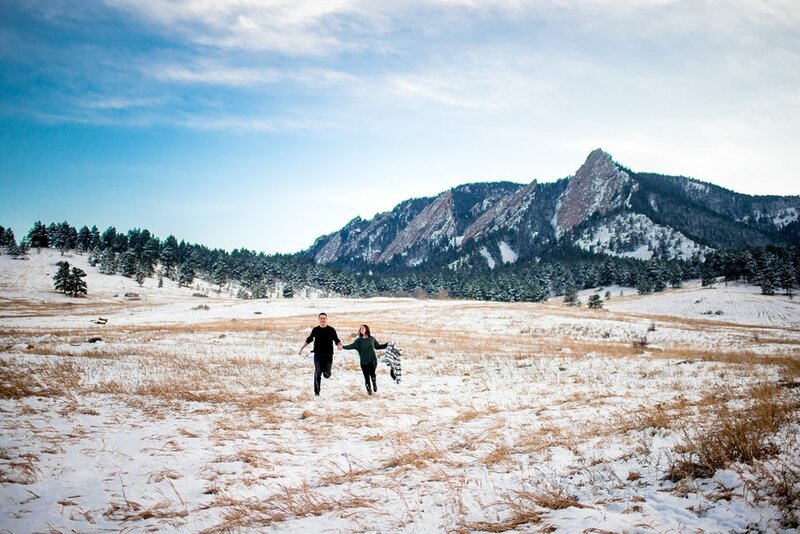 When shooting in Boulder however it is easy to accomplish both so we finished the session over at Chautauqua in it’s state of snowy perfection and I am so happy to share all of my many favorites from the session here today.